Keep all your favorite knives within arm's reach! No more fumbling around searching for the right knife. Unlike most knife blocks, our beautiful bamboo storage block stores up to 19 knives, with extra slots to store kitchen scissors and a sharpening rod. We heard your feedback and complaints, and we have improved our knife slots design compared to existing competitor knife blocks: We designed the knife slots for easier handling and made them larger to better accommodate those larger knives. We made all the knife slots wider, allowing you to fit a larger variety of blade sizes; so you don't have to worry about not being able to fit your specialty knives, or having to search for the correct slot every time. 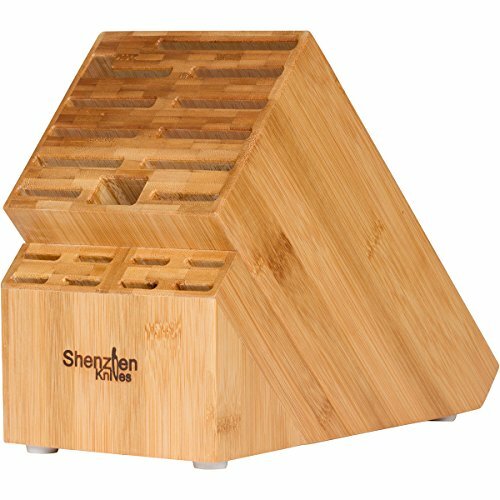 The Shenzhen Knives 20 slot bamboo knife block makes storing knives hassle-free, so you can spend less time fumbling and more time cooking!